Yaseen Hasan is a director in the Planning and Research Department within the Ministry of Electricity in Kurdistan Region, Iraq. Hasan participated in the Humphrey Fellowship, which brings young and mid-career professionals to the United States for a year of non-degree, graduate-level study, leadership development and professional collaboration. At WRI, Hasan worked on a project addressing mechanisms for rooftop PV cells and hot water systems in the Iraqi Kurdistan region. For the more than 5 million people living in Iraqi Kurdistan, a semi-autonomous region in northern Iraq, reliable energy is a luxury. Iraqi Kurds lacked power for an average of four hours a day in the spring and more than 13 hours a day in the winter in 2016 due to government-mandated electricity shut-offs, according to the Ministry of Electricity in Kurdistan. Electricity demand has surged in recent years due to economic development. The problem was exacerbated due to an influx of nearly 2 million refugees escaping ISIS and the Syrian war and internally-displaced people from other parts of Iraq, as well as a dramatic drop in oil prices. Iraqi Kurdistan’s inefficient energy infrastructure simply can’t keep up. The situation may seem oxymoronic in a region flush with oil and gas. But there’s another abundant and untapped energy source that could provide a solution—the sun. Iraqi Kurdistan sits in a particularly sunny region. The average daily solar radiation is nearly 5 kilowatt hours per square meter (kWh/m2/day), slightly less than the daily potential of the state of California. Yet the region has yet to really invest in distributed solar power. There are currently only three small, privately developed solar PV sites, with a total generating capacity of 500 kilowatts (kW). The Iraqi-Kurdistan government hasn’t invested much in renewable energy infrastructure due to its huge oil and gas potential, paired with a recent fiscal crisis that began in 2014 due to disputes within the central government and the fast expansion of the Islamic State. Facing growing electricity shortages, many Kurds have turned to private small diesel generators. But these have their limitations. They’re expensive—costing about $0.25 per kilowatt-hour (kWh), compared to the $0.02 that domestic consumers pay for electricity from the grid. They also can’t truly make up for the energy shortfall, operating a maximum of 6 to 8 hours per day. They’re also dirty, creating dangerous air pollution and emitting greenhouse gases. 1. The power sector needs a more effective management structure. Iraqi Kurdistan needs an independent system regulator and operator in order to develop well-designed policies, attract investors and help establish a competitive wholesale electricity market. Iraqi Kurdistan’s power system is currently vertically integrated—the Ministry of Electricity controls all facets, from customer access equipment to billing and accounting services. This is inefficient because there is confusion and disagreement within the ministry over which authorities are responsible for which facets of the system. Over the next 10 – 15 years, the power sector needs to, step by step, unbundle this structure. 2. Several technical reforms must take place. Implementing tariff system reforms meant to bridge the gap between cost and revenue and to decrease the energy waste caused by ineffective subsidies. 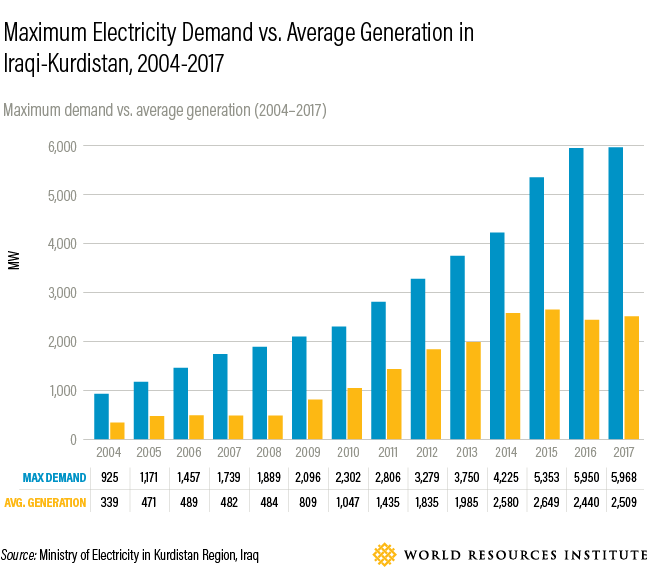 Currently, Iraqi Kurdistan subsidizes up to 85 percent of each kilowatt-hour, putting a burden on the government’s budget and causing people to waste electricity because they don’t have to pay for it. This effectively props up fossil fuel generators and disadvantages solar. Not addressing rampant electricity theft is one of the reasons for Iraqi Kurdistan’s energy shortfall. The electric meters currently used are electromechanical, which allow people to connect high energy-consuming devices such as electric heaters and air conditioners to distribution lines without paying for their use. Using Advanced Metering Infrastructure (AMI), a new smart metering system, instead of existing traditional electricity meters could curtail this loss because it can detect unusually heavy demand. Smart meters can also be used to shut off service to consumers who don’t pay their bills. Providing natural gas to all five gas power plants as a means to increase their operational generation capacity. Establishing a new renewable energy agency with the goal of setting clean energy targets, which will help meet increasing demand over the next few years. Both consumers and utilities need incentives, as well as policy and financing mechanisms, to make the transition to renewable energy. These renewables can replace existing diesel generators. Establishing a new agency for energy efficiency and demand-side management to help meet demand. Iraqi Kurdistan has enormous potential for solar generation. But in order to achieve it, the region needs well-designed, smart policies that address the numerous challenges facing adoption of renewables.